In 1972, the leap-second system was introduced so that the broadcast UTC seconds could be made exactly equal to the standard SI second, while still maintaining the UTC time of day and changes of UTC date synchronized with those of UT1 (the solar time standard that superseded GMT). By then, the UTC clock was already 10 seconds behind TAI, which had been synchronized with UT1 in 1958, but had been counting true SI seconds since then. After 1972, both clocks have been ticking in SI seconds, so the difference between their readouts at any time is 10 seconds plus the total number of leap seconds that have been applied to UTC (37 seconds as of January 2019[update]). The UTC standard allows leap seconds to be applied at the end of any UTC month, with first preference to June and December and second preference to March and September. As of January 2017[update], all of them have been inserted at the end of either June 30 or December 31. IERS publishes announcements every six months, whether leap seconds are to occur or not, in its "Bulletin C". Such announcements are typically published well in advance of each possible leap second date – usually in early January for June 30 and in early July for December 31. 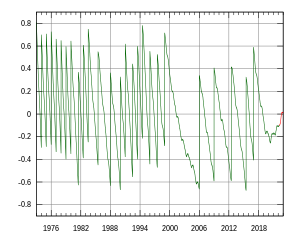 Some time signal broadcasts give voice announcements of an impending leap second. ^ Kenneth Seidelmann. "UTC redefinition or change". Archived from the original on January 10, 2006. This page was last edited on 11 April 2019, at 19:19 (UTC).